Yesterday my friend Beth and I made a trip to Fayetteville and enjoyed our second time of taking tea at Aunt Laura's Sweet Shoppe and Tea Room. 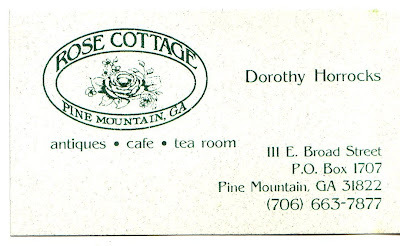 We enjoyed the good food and service we experienced before, and "Aunt Laura's mom" asked us our review of a new finger sandwich she was serving: cream cheese with orange marmalade and pecans on dark bread. We both reported we liked it, and she seemed very pleased. Everything was quite tasty, but I was truly impressed with their homemade petits fours, which were as light and moist as you'd ever hope to eat, not the rock-hard petits fours you often get. I bought a few things in the gift shop area, a cookie and some silverplated rose teaspoons, and they came home in this sweet little bag. 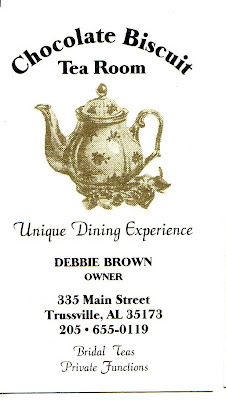 You know from earlier in the week I like to collect tea room business cards (and I don't remember getting one from here before), so I tucked a business card in my purse. When I got home, I did something I wish I'd done with all the others: I wrote on the back the date and the name of my tea party friend. Their cookies were so pretty it made me want to get out my own cookie baking supplies, and I also got these silver teaspoons that are just like some gold ones I already own. Last time I was in the shop I bought some tea, which is probably my favorite tea room "souvenir," but I also like to buy accessories like these teaspoons. 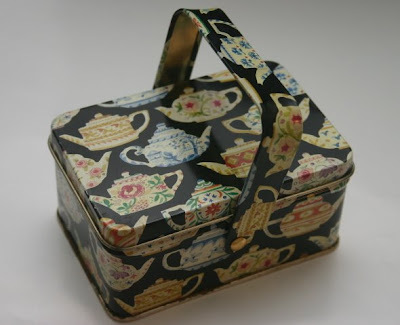 In fact, my top three "tea room souvenirs" would probably be tea, accessories for the tea table, and books on tea. 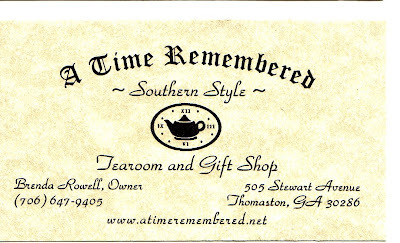 What are your favorite tea room souvenirs? Ready to try some new teas? Today at lunchtime, I'll be going to a tea room with a friend for lunch. I'm looking forward to catching up with my friend and seeing what this tea room is up to these days, but I'm also looking forward to trying a new tea or two. After drinking gallons of iced tea this summer, I'm starting to get a hankering to trade in my pretty iced tea glasses for some cups and saucers and brew up some steaming cups of tea with cinnamon and spices and cranberries and other "fall" tasting flavors. And that brings me to a great new resource that some of you may wish to check out. Do you subscribe to the World Tea News? You can sign up at worldteanews.com, and you'll get an information-packed e-mail in your in-box each week, and no junk. This week's e-mail contained a link to the World Tea Buyer's Guide, which reviews 200+ teas entered in this year's World Tea Expo competition. This is a free download, and you can read a summary and/or download it here. If you try one of these new teas, please share your review! 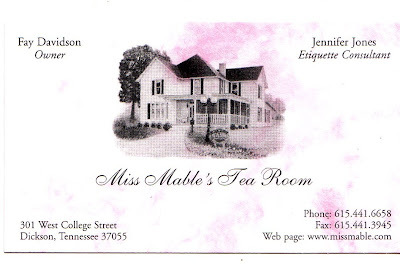 Over the years I've made a point of collecting business cards from the various tea rooms I have visited. 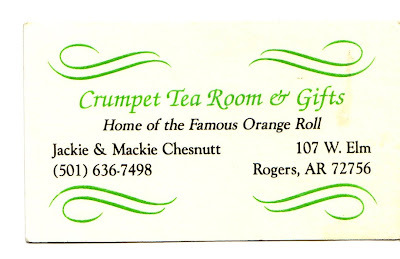 The very first one, up top, is from the Crumpet Tea Room in Rogers, Ark., since it was the first tea room I ever visited. 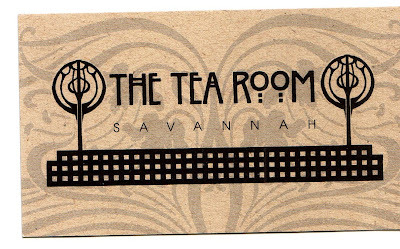 Next is my favorite Georgia tea room, The Tea Room in Savannah, followed by others I have visited and enjoyed. 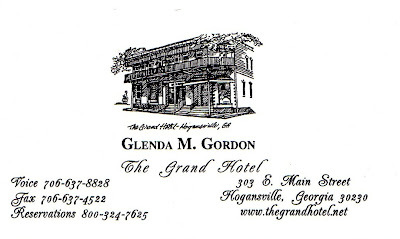 I should point out that the Grand Hotel's tea room, Urban Tea Party and A Time Remembered have all closed, although I have lots of pleasant memories associated with these places. 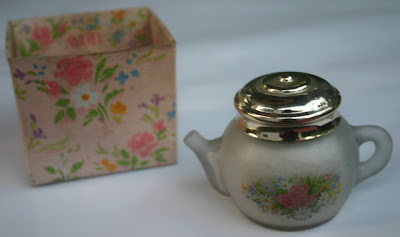 Last weekend, I was at the Big Shanty Antique Mall in Marietta when I came across this little teapot tin for $2. I liked the handle on it, and almost the second I saw it I knew it would be perfect for holding business cards of tea rooms and tea businesses. 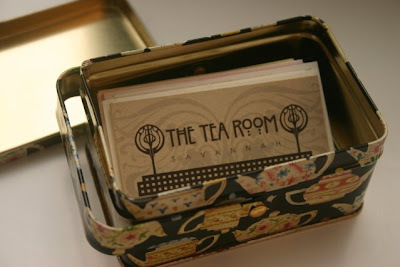 Do you save tea room business cards? If so, how do you display or preserve them? "For our tea selection today, we have two iced teas, a sweetened Mango Tea and an unsweet organic Peppermint Tea. Our hot tea is an Apple and Cinnamon flavored tea. Our menu today begins with a Chicken Salad Scoop with Butterfly Garnish. For our scones, we have Currant Scones served with Lemon Curd and then Chocolate Chip Mini-Scones as well. Our finger sandwiches include the teapot-shaped ones, which are Cucumber Cream on white bread, and then the heart-shaped ones and the pinwheels are homemade Pimiento Cheese on wheat bread. For our sweets, we have Arnold Palmer Cupcakes and, of course, Daddy's Coconut Cake." That's almost verbatim what I said to everyone yesterday at Aunt Jane's Birthday Tea. I always love giving that little spiel just like I would do at my own tea room. The Pimiento Cheese recipe is from the book Screen Doors and Sweet Tea by Martha Hall Foose, and I like it so much I've been making a batch weekly for sandwiches. I made a loaf of wheat bread in the bread machine Sunday after church, froze it for a couple of hours so it would be stiff enough for slicing, and then I was able to cut off the crusts and get a nice long slice to roll up, spread with the Pimiento Cheese, and cut into pinwheels. I figured I was home free on that idea, but then Monday morning the bread, which I'd thawed, didn't roll up well at all, so I just sliced the bread and cut it into heart shapes. I'd still like to make a pinwheel finger sandwich that is on real bread, not on a tortilla, but I want the bread to be longer than a regular slice of bread. Ideas, anyone? The Arnold Palmer Cupcake recipe was sent me by my sister, who found it here. I've been drinking my friend Beth's famous Lemonade Tea for years, but only last weekend did I learn (from some Foot Network guy) that an Arnold Palmer is the name of the drink that's half sweet tea, half lemonade. Who knew? (OK, the golfers knew, but I'm not into golf.) 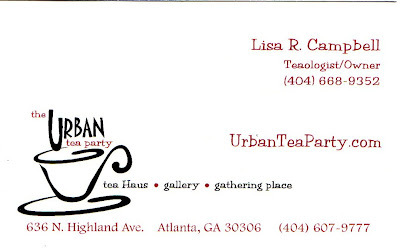 I found the teapot cupcake picks on eBay, from this seller and this seller, both of whom had great service and prices. I ordered from two different sources just one week ago, hoping at least one set of picks would arrive in time for the tea. And they both did. No wonder I love eBay. And following are a few more miscellaneous pictures. 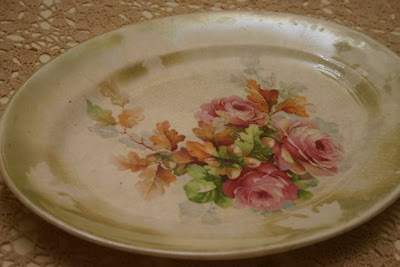 One of them is of a silver overlay dish I found the other week (a real bargain at just $2.75) at an antique mall. I didn't realize until polishing it up to use with the pink rose sugar cubes I made that the little dish matches the tea pitcher I found a few weeks back. Love when that happens. And I love hosting tea parties! Growing up close to an aunt with a mental "issue" was no doubt very good for me and my sister and gave us lots of exposure to those who are "different," so I think because of that we are probably comfortable around a lot of different types of people. Aunt Jane can be a challenge sometimes, as my sainted parents know well, but she is also tremendously good-hearted and quite a lady to boot. So today I had the day off work and my family and I helped dear Aunt Jane to celebrate. Here she gets a hug from her great-niece Amelia. But here's what her table looked like. On the table in the dining room, I used this tea set that was a gift from Aunt Jane. And here's Cari. I bought this dress recently at a Collins and Wood estate sale imagining she would enjoy playing dress up in it. She did. And here's Amelia. 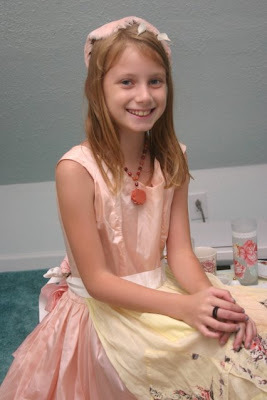 And as Amelia rather bluntly told me at one point, "That's enough pictures." If you don't mind, I'll share a few more tomorrow and share some recipes as well! You know, I have so many enablers in my tea habit, I will never get over this fondness for all things tea! 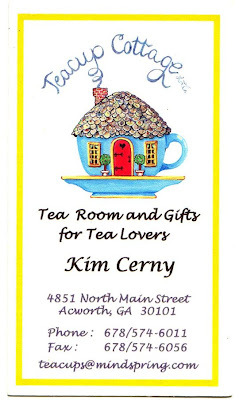 Just in the past week, I've been e-mailed tips about where to find a great tea-infused cupcake recipe (my sister Rhonda), where to find a green tea Kit Kat bar (my blog reader friend Gerri), and where to find an adorable tea mug cozy (my friend Mandy at work). I know some of you think I'm far tea-wiser than is true, so I just wanted you to know that my associates deserve their due. 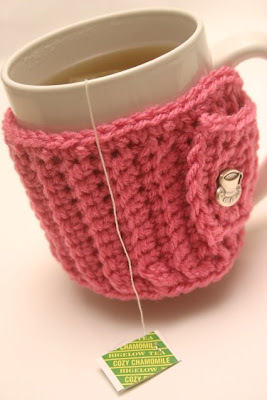 And when Mandy sent me a link to a website featuring some adorable crocheted tea pot and tea mug cozies, I knew I would be trying to crochet one of these mug cozies for myself. I'm so ready for fall, I think the idea of making a cozy little cozy really appealed to me. And what teabag did I use for evening sipping once the cozy was complete? 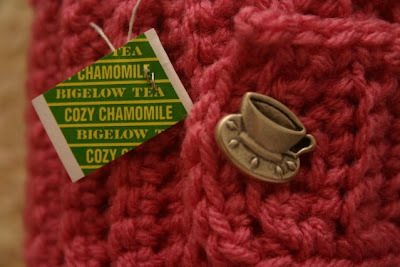 Why, Cozy Chamomile of course! UPDATE: I am afraid I didn't keep this pattern (no one was interested when I wrote this post years ago), so the pattern is no longer available. There are, however, plenty of similar patterns on Pinterest and on the internet. Good luck! As a slow reader, I am not normally one to start and finish a book in a single evening, but I did last night. It's the 1932 book "To Think of Tea!" by Agnes Repplier. Is she possibly one of the ladies in the photo opposite the title page? The book doesn't say. I don't know anything about Agnes except that she has written what is possibly the most delightful, lively and entertaining book about tea I've ever read. I learned so much that was so helpful, so interesting. For instance, we tea lovers have long heard that it was the Portuguese Catherine of Braganza who brought tea to the court of England. But I did not know it was because Catherine was barren that her husband, Charles II, "strove to give her what trifling pleasures he could." Agnes makes lots of social commentary throughout her book, noting sweetly that Charles "was always, save in the matter of faithfulness, considerate of his spouse." She compares him with other rulers who were both unfaithful and ill-tempered, so I suppose she has a point. I could easily share a dozen more charming passages, but permit me one more. Keep in mind she is writing in 1932, when the tea room craze in America was in its heyday. She was put out that some tea rooms did not, in fact, serve tea, and the ones that did didn't take it seriously. "A whole page, several columns wide, about tea-rooms holds never a word about tea, save and except the satanic suggestion to put a piece of preserved ginger, or a couple of cloves, into the tea-pot." I love Agnes, and I'll bet some of you will too. I found my copy of her book on eBay, and if you come across one yourself, I'd love to hear your review! In college, I was an Avon lady. An enterprising team manager knew a potential victim when she saw one, and she lured me in with the promise of getting a huge discount on the new Scarlett O'Hara porcelain figurine if I joined up, so I did. (I was a huge Gone With the Wind fan back in the day.) My career with Avon was short-lived, but through the years I've remained awfully fond of Avon and those cute little "campaigns" they issue every two weeks. I think there's a good chance they'll offer teatime collectibles in the future, but the two Avon collectibles I currently own are both courtesy of Avon past, including this Teatime Moonwind Powder Sachet. The little glass figurine has holes in the top, so you can shake out the powder. Let's just say the powder is not a scent I wish to wear throughout the day, but I love the little glass teapot. 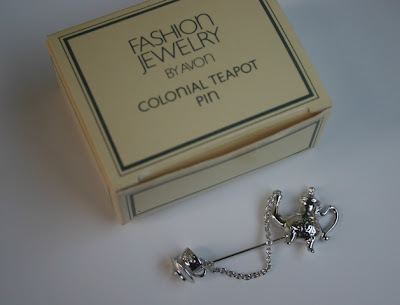 Another eBay find was this Colonial Teapot Pin, in the original box, from 1982. That's the year I graduated from high school! I know I was an Avon customer by then, but I don't remember this teapot stick pin, although I do remember that stick pins were fashionable jewelry during my high school days. 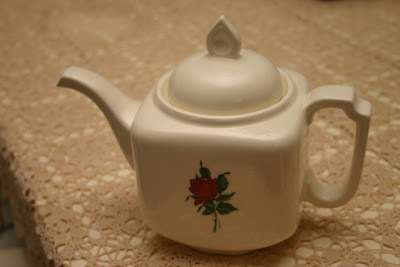 There are several other teatime collectibles Avon made that I'd like to own if I ever find them for a good price. There are at least two more pins (one is gold with a rhinestone drop of "tea," the other a blue and white porcelain teapot), and there's a whole set of beautiful teacups I think were either sold or given exlusively to Avon reps. I saw a nice display of them in an antique store for $40 per set. 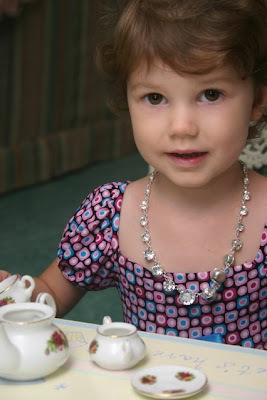 And finally, there is a Tea Party Barbie Avon made that both my niece Cari and I want! Over the weekend I was in a Publix in Gainesville when I spotted the famous "clearance rack" I have learned to visit at all Publix stores. Leftover summer toys and things were popular here on Lake Lanier, but of course I had to check out the entire clearance rack to satisfy myself there were no good buys to be had. And then, Eureka! 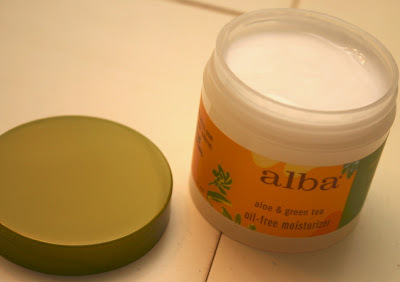 I found Alba's aloe and green tea oil-free moisturizer on sale for $6.50 (retail price: $16.95). 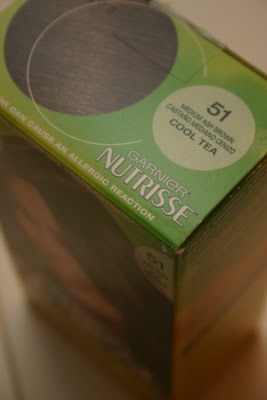 I checked the label and camellia sinensis leaf extract is indeed an ingredient. I was surprised to discover such a noticeable floral scent on this facial product. I happen to really like the scent, but I'm betting others would prefer no scent, so if you come across this product you might want to be aware of this particular feature. It's a lightweight moisturizer, and so far I'm very happy with it. 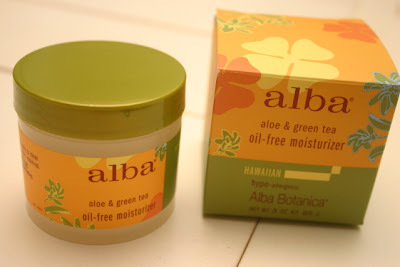 I'm rather surprised I haven't heard of Alba cosmetics before. Does anyone have any other experience with Alba's line? Now that my enthusiastic support for Michael Phelps has succeeded in helping him win those eight gold medals, I can return to thinking about other important things like tea parties (I've got one coming up in a week) and decorating for the golden season that's just around the corner. 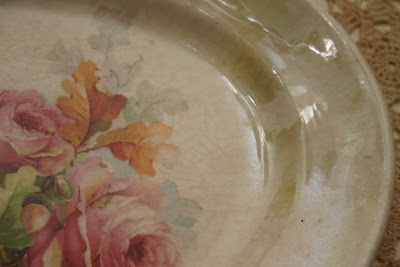 When my mom and I went antiquing last weekend (the Rome/Adairsville area), I found THE perfect platter for fall teas. It's a nice size, about 9 x 13 inches, and it features the roses I so love intermingled with the oak leaves and acorns of fall. This platter has an interesting edge treatment. It's got an iridescent green finish (which is hard to photograph, I learned), but it looks like leaves were somehow stenciled onto the edge. Can you see them? I hope so, because I think they're really pretty. There's some crazing too, but no chips or cracks, so I'll probably use this for serving scones or madeleines. Perhaps I was just weary of summer, but I definitely had other seasons on the brain during that shopping jaunt. I rarely buy anything with red in it, but this small teapot was just $3 and said "Christmas decor" to me. 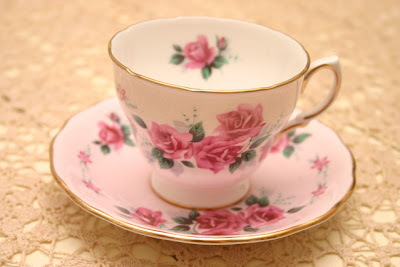 Closer to home (Gail's Antiques in Senoia), I found this sweet pink teacup and saucer with roses. It's not like I *needed* another pink teacup and saucer, but when I find a really pretty one for a good price, I just look at it as stocking my future tearoom! Sometimes, it's good to be a Pinhead!